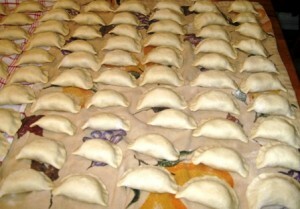 One of the most popular dishes in Eastern European cooking are Filled Dumplings, known as: Varenyky, in Ukrainian (also very often referred to, incorrectly, as “Pyrohy” ), or Pierogi in Polish. They are made from homemade pasta dough, and filled with variety of fillings, but potato and cheese filling is on of the most popular ones. These dumplings were made for generations, but if you ask your mom, or grandma, for a recipe, you get a very vague list of ingredients with even less detailed preparation instructions. The first time I made Varenyky at the age of 18, and before Google time…., I also played by ear with measuring the ingredients, but to my surprise they turned out quite well. Thanks to Google and YouTube, you are able to find any recipe you wish to try out. 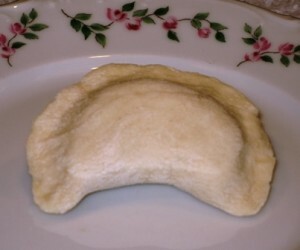 Today I will share my own ingredients, step-by-step instructions as well as pictures, so you can give it a try and enjoy your own homemade varenyky/pierogi. The filling needs to be prepared ahead of time, to allow it to cool off before use. Potato filled Varenyky are best served warm with onions sautéed in lots of butter, accompanied by a dollop of sour cream, or gently sauteed to make them crispy. YUMMY!!!!! They also freeze very well, but need to be cold and well coated with oil, or melted butter, to prevent them from sticking. Then layer one dozen of them in a zip lock plastic bag, close securely while letting out as much air as possible, and they may stay frozen for up to 3 months. Someone just told me that they add softened butter to their dough, so I tried it, and it is such a wonderful change. It makes the dough so soft and pliable, therefore I UPDATED my original recipe with this adjustment (March 2018). 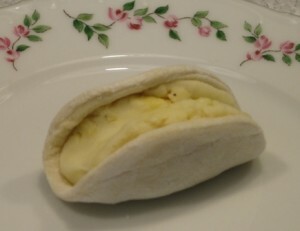 This recipe makes about 60 pieces of varenyky (using 3″ biscuit cutter). Start your dough on a countertop, or in a large bowl. Use a spoon to incorporate the wet ingredients with the dry ones, until the batter is thick enough for kneading. Once the dough is soft and silky, form a ball, cover it with a tea towel and let it rest for at least 15 minutes. 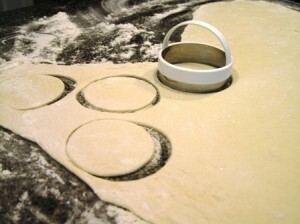 Roll out your dough to about 1/8 inch thickness, to get it ready for cutting out circles. 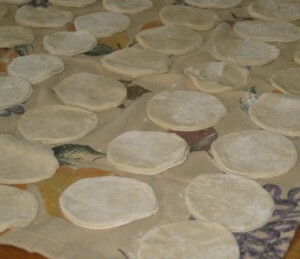 Using a 3 inch biscuit cutter, cut out circles from the rolled out dough, until all is used up. Place the circles on a floured tea towel, and cover with another towel to prevent them from drying out. 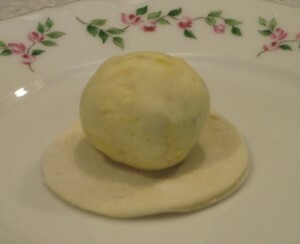 Place a heaping teaspoon of filling in the middle of a dough circle, or roll your potato filling into ready to use balls, the size of a walnut. Fold filled circle in half, and pinch sides together well enough so they do not open up. 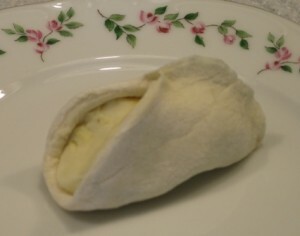 Poorly sealed Varenyky will open up during cooking, and the filling will boil out. Measure 4 cups of flour and place it on your counter top in a mound, or in a large mixing bowl,making a well in the middle. Add the egg, salt, sour cream and butter into the well. 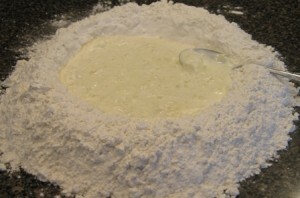 Using a spoon, start incorporating the flour from the inside of the well, into the wet ingredients, forming soft dough. Keep on adding the milk slowly into the mixture, until all used up, plus additional water if needed, to form a soft, sticky dough. 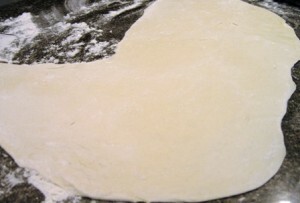 Incorporate the remaining flour, until a soft and silky dough is formed. Do not over knead the dough, so it does not get tough. It should feel like fresh pizza dough, but slightly softer. 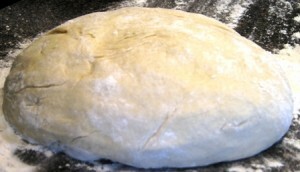 Place your dough on a floured part of a countertop, cover with a tea towel, and let it rest at least 15 minutes. 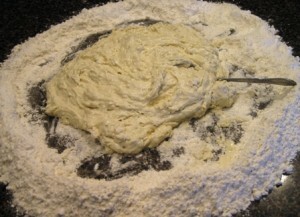 Generously flour your work area, and roll out 1/2 of the dough, to a very thin sheet, about 1/8 inch thickness. Leave the second half of the dough covered to keep it from drying out. Form a new dough ball from the remaining dough left from the cut outs, and repeat the above rolling/cutting out process, one more time. Repeat the process with the second half of the dough, which was resting during this time, until all used up. Now you are ready to fill your dumplings with your favorite filling, which needed to be prepared ahead of time, so it had a chance to cool off. Place a heaping teaspoon of filling in the middle of a dough circle, or roll your potato filling into ready to use ball, the size of a walnut. Fold filled circle in half, and pinch sides together well enough so they do not open up. If you do not seal them well, the filling will boil out during cooking time. Repeat the filling/pinching process until all circles are used up. Keep the finished Varenyky covered with a tea towel, until ready to cook. Fill a large pot with salted water, 2 Tbs. oil, and bring to boil. Gently lower 8-12 Varenyky into the boiling water; be careful to avoid splashing hot water on yourself. Stir gently, with a wooden spoon, to prevent Varenyky from sticking to the bottom of the pot. The Varenyky will float to the top of the water. Do not cover the pot. Bring back to boiling point, and boil for 2 minutes, stirring occasionally. Remove with a slotted spoon into a strainer placed over a bowl. Fill a large bowl with cold water, and empty the Varenyky into it, to cool them down for few minutes, then pour out into the strainer again to let the water drain off. Then slide them off onto a large plate to cool off. By this time your water is boiling again, so repeat the cooking process until all Varenyky are cooked. Fill a medium size pot with water, add potatoes and bring to boil. Sauté onions in butter, until golden. Drain water from cooked potatoes. Add sautéed onions, cheeses, salt and pepper. Some of the store bought are better than others…you just have to try different brands until you find the one you like the best. Also, there are many Polish and Ukrainian churches selling them, around Christmas and during lent. Those are as good as homemade. Wow yummy and great recipe.. My mouth is full of water.. If you like the store bought kind, you will definitely like the homemade ones so much more. Thank you for stopping by, and for your comments. what is white & yellow American cheese? Can I use tasty its our only yellow cheese and white cheese is greek fetta as I live in Australia? If you like Feta cheese, it will be fine as well. My mom only had white farmer’s cheese and it tasted fine as well. Some people use cottage cheese. Please let me know how you liked them with the Feta cheese. Yellow or White American cheese, is a firm block of cheese, ususlly sliced, and mostly used on sandwiches, or for grilled cheese sandwiches. It is milder in flavor than Cheddar cheese. When you break up the slices into hot, cooked potatoes, it melts and blends nicely into the potatoes, enriching their flavor and giving them a rich golden color. I am going to make these yummy Varenyky this weekend! It’s great they freeze well, sorry silly question but do I need to cook them as per your instructions then let them cool down then I freeze them in a zip lock bag? Also when I want to eat these do I just defrost these Varenyky and then do I reheat/boil them in warm water again? I am so excited that you will be cooking some Varenyky. I cook them for as long as posted, since we eat most of them fresh, and freeze any leftovers. Also, I do not cook them again after freezing. Important thing is to make sure you cool them completely before freezing. I coat them with some canola oil, once they cool off slightly, so they don’t stick, then I let them cool completely, but make sure you keep them covered so they don’t dry up on you. Once totally cooled, I lay them flat, one dozen at a time, in a freezer ziplock bag, and freeze them. I thaw them in the same bag in the refrigerator, for at least 24 hours, then just warm them up on a pan, or microwave. My husband likes them fried, so I fry them with some butter or oil. Great thanks for getting back to me! I can’t wait to cook these…. yumo! As always, you are most welcome. Yes please post more fillings for verenyky, that would be wonderful. Yummy blueberry filling…ahhh delicious. My baba used to make a cherry filling too that was delicious, we never wrote down any of her recipes actually it was hard to get a recipe out of her as she always said it was a pinch of this a pinch of that and mum doesn’t cook ukee food much so I am keen to learn myself. I need to work on that post….will do, for sure. Yes, European cooks had their recipes memorized, and I think always altered them as needed, that is why they could not provide a precise account of the ingredients. Actually, after a while, we all cook that way. Don’t you agree. With baking though, it needs to be quite specific, to be successful. Thanks, I look forward to your posts!!! I totally agree, after you make your favourite recipes over and over again you can alter them as you know them off by heart and you are confident to make any changes and know they will work. Yes and baking needs to be spot on to work for sure. Something else you can do which will save you a lot of time is to lay the vereneky on a parchment lined cookie sheet after you pinch them and put them straight into the freezer. You can even do more than 1 layer on the sheet as long as they are separated with parchment. No cooking required at this point. As long as they are not touching, once frozen, you put them into freezer bags and of course there is no sticking and you can take out however many you need at one time. To cook you pop them straight from frozen into boiling water. Just make sure not to put too many in at one time as it drops the water temperature very quickly. I totally agree with your suggestion. I have tried this before, and it does make it very convenient to take out only few at a time, to cook as needed. I usually cook them all, cool them, butter them, or oil them, then pack them in freezer bags for future use. These are best slowly defrosted in the fridge then warmed up in the microwave, or fried in a pan. Lots of people love these fried, to get that crunchy outer layer with the soft, tasty middle…yum. Thank you very much for stopping by, and leaving such a helpful suggestion. might you have a recipe for Varenyky dough that does not have any wheat in it? we love eating varenyky only to feel ill afterwards we all have a wheat allergy. I was wondering about Quinoa flour; can it just be substituted for the wheat flour? should it be blended with rice flour? we have tried spelt flour with poor results. do you have any suggestions for a recipe? So sorry to hear about your wheat allergies. I have never used any other flour than all-purpose white, to whole wheat, so I don’t really have a good answer for you. I will take your question as a challenge for my next batch of varenyky, and post the results. I will try different flours for small batches, as a wonderful experiment. Thank you for the suggestion, and for your comment. Please keep on visiting my site, and one day (hopefully soon), you will find an answer to your question. how many will this recipe make? You should be able to get at least 60 pieces (5 doz). Why is it that you say they are incorrectly referred to as pyrohy? That is all my family or church community has ever called them. It is not my intention to come across as rude, I just wondered why you are of this opinion. Pyrohy on the other hand are BAKED pastry…and usually yeast raised and filled with filling of choice. I am not sure why many people call Varenyky as Perohy…pyrohy…but I think that maybe it is derivative of the Polish name for these Pierogy…and Ukrainians don’t use the “G” sound so much… but more of the “H” sound…like Polish “Golobki” stuffed cabbage rolls…and Ukrainians call them “Holubtsi”…this is only my opinion here….